A self-described "memoir autodidact" and distinguished author's refreshingly idiosyncratic guide to the art of creative nonfiction. 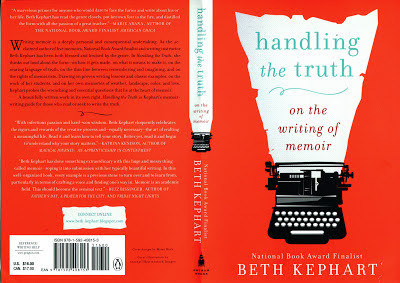 National Book Award finalist Kephart (Small Damages, 2012, etc.) began her literary career writing "from the margins." This book, which grew out of creative nonfiction classes she taught at the University of Pennsylvania, is not only about "the making of memoir and its consequences," but also "its privileges and pleasures." Though firmly rooted in personal experience, memoir is not an exercise in narcissism. As Kephart shows through examples from writers such as Michael Ondaatje and Annie Dillard, it is a process by which "memoirists open themselves up to self-discovery and make themselves vulnerable." Those interested in writing creative nonfiction must actively read it so that they can begin to know not only what moves them, but what goals to set for themselves in their own work. In setting out to actually write a memoir, Kephart advises writers to start small, using notes on and photographs of everyday life to start, while mining sensory details, situations and landscapes for meaning and metaphor. Awareness of what is at stake, not just for themselves and those whom they portray, but also for their readers, is also crucial. For Kephart, memoir is an act that brings a single person closer to the "us" of collective human experience. In the process of self-discovery—and like the Penn students from whose work she quotes liberally throughout—memoirists must also learn to ask the right questions about the past and about life itself. Perhaps most importantly of all, though, they must remember the things they love. Only then will they find their own authentic way of writing "toward the truth." Generous, intelligent and genuinely insightful. Really looking forward to reading this book for myself! Congrats!! Can't wait to get my hands on this book.